I think many of us have or had at some point in their life a subscription to a beauty box. There is just something to it to get a little beauty suprise package each month delivered to your home with all shiny new products to test. So i myself have a subscription to the german glossy box (it does not exist in Belgium so i get it delivered to my parents and pick it up when i visit), and the french birch box (they deliver to Belgium now). One thing i noticed after having this subscription for a while is that a tonne of the products and brands are not only new to me. They seem to be in fact new to everyone who is not a subscriber. Even when i google the products i usually just find reviews from other people with a box subscription. So far no problem since it is great to try out really new products. However, this products seem to be also partly not even available for buying in a shop but needs to be ordered in an intricate way, or in the case of glossybox sometimes i simply cant buy the product. Long story short, i often use up the products and then forget about them again. 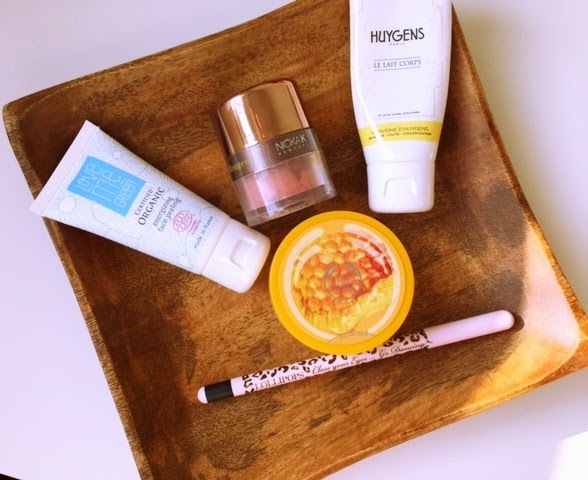 However there is a few products, which were actually so great that i have fallen in love with them and ended up tracking them down and ordering them. So i thought i introduce you to this beauties. 1) The Love me green organic face peeling. This was such a lovely little product. It is made of organic ingredients, produced in france and gives you the most refreshing mild exfoliation ever while smelling gorgeous. My sensitive skin reacts bad to quite some exfoliators but this one gave me no trouble whatsoever. 2)The Nika K blusher. This packaging is so cute. I really started to appreciate this powder. Inside you find a sponge through which the powder is applied onto your skin. However, i usually remove the sponge and pick up some powder with a brush since the sponge gives a very uneven application. The colour however is gorgeous and it lasts all day on my cheeks. I have no idea how to repurchase this safe via the birch box site itself but its very decent size makes sure i won't have to too soon ;). 3)The Huygens Verveine body lotion. This product was a funny story for me. I first did not like the scent at all. It smelled quite minty and somehow reminded me of a fresh package of chewing gum scent wise. However, i hate wasting things and i liked the idea that it was handmade from all natural ingredients, so i applied it anyway. And wow! This product felt to amazing on my skin. It gave me a slight cooling effect all over my body which helped me to relax and i swear i slept better with this bodylotion on. I have used it up till the last drop and i already reorderd it. It is only available at the moment via birch box but if you find yourself in Paris you can visit their store and get your lotions and potions individually scented. I for sure will pay them a visit: http://www.huygens.fr . Something tells me this brand will still make its way in the beauty world. 4)A little cheat here since i know the body shop before and since i love honey i would have probably tried this anyway but this was my first ever body shop scrub and while i prefer the lush scrubs a tad more, i just love love love this scent. 5)The lollipop eyeliner in black. this is a super cute liner which confuses me. You can smudge it if you want, jet it never smudges on its own and that is very rare on my oily eyes. So well whatever this magic is, i love it. This comes also from a french company which offer a whole range of make up in cutesy packing. Think the balm with a french touch. I will for sure try some more make up of this range. Saying all this. I noticed that for some reason my article had not been properly stored to the site so if you just got a short cut of this on your first visit, i apologise. Do you have any beauty boxes? Was there anything you fell in love with from a beauty box that you would not have tried otherwise? I've never tried one of these beauty boxes. Always scared they will be filled with products I don't want, but the Love me green organic face peeling seems really nice. It is really nice and you can order it from their website. I just noticed that blogger ate half my article :(. So i updated now and you can read the full article if you like. I had the same worry about beauty boxes but so far this has been very seldom the case and in the few cases i had i was able to make a friend happy with the product. Most boxes can be cancelled as well at any time. But if you are very particular with your brands and products (which i fully understand), then this is definitely not for you. I cancalled all my subscriptions to beauty boxes. Too often I felt dissappointed/could not use any of the items I got. Thats sad. I think i have been rather lucky with mine. But indeed the products start to pile up fast. I think i would be lieing if i would say that this beauty boxes safe me any money in terms of purchases but i just love the suprise box effect and i also like this a lot for buisness travel. Nothing to cheer me up in a lonely hotel room like trying out a nice new product ;).